Sony outs Xperia SL on its website before officially announcing it in the public on August 29. 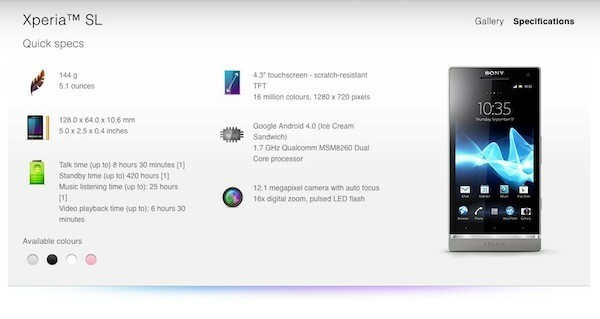 Basing on the specs, this latest Xperia release is a bump-off of its latest flagship – Xperia S.
Other that faster CPU and Ice Cream Sandwich out of the box, Sony Xperia SL is basically the same as its predecessor. It runs in the same chipset with 1.7 GHz dual-core Qualcomm S3 processor. The rest of the features are familiar: 4.3-inch Bravia Engine with 720p display, 12.1MP shooter with 1080p video recording, 1GB RAM, 32GB non-expandable storage, HDMI connectivity and NFC-enabled. This new wave of Xperia will come in Black, White, Silver and Pink colors. I can’t see myself being "uberly" excited about this press release, but this coming with cheaper (or same price range as the Xperia S) price is a different story. I would like having a better option for those who are planning to buy the Xperia S.